"If those in power can't be trusted, it's the responsibility of the people to remove them." Spider-Man: Noir is a four-issue miniseries which reimagines the Wall Crawler into the genres of Film Noir and pulp fiction. It is set in New York during the Great Depression. Part of a lineup of Genre Throwback miniseries featuring Marvel's most popular characters, it is also known for its sleek design and its version of Spider-Man being part of the video game Spider-Man: Shattered Dimensions. It was followed by another mini called Spider-Man Noir: Eyes Without a Face, taking place a year after the previous mini. In Spider-Man: Noir, Norman Osborn, a man known in certain circles as the Goblin, has everybody in his pocket. The mayor, the police, the local newspapers. May Parker is a notorious trouble maker for the corrupt regime. She and her nephew Peter lost Ben Parker, a big player in the underground movement against the government's abuse, until one day he was beaten up and savaged by dogs. When Peter stands to defend his aunt from the Enforcers, he's noticed by Ben Urich, an Intrepid Reporter, who gets his boss J. Jonah Jameson to hire Peter on board as a photographer's assistant. When the Enforcers try to jack a spider idol from cargo meant for the museum, Peter gets bitten by one of the spiders inside the idol, gains spider-like abilities, and takes up the mantle of Spider-Man. As he goes to confront the Goblin, it turns out Urich is in the pocket of Norman as well, which quickly leads to his death. Spider-Man gets framed for the death of Jonah, who gets shot in the first page of the first book. Felicia, the owner of the Black Cat, gives Peter secret files on Norman and his past. And he finds out that Jonah's death was faked, and returns home just in time to save his aunt. He goes to confront Norman once more who's kidnapped Felicia Hardy, for killing "Jameson". Spider-Man trashes Kraven, and chases Norman down into the sewer system. He unmasks him, and refuses to shoot him. Norman tries to shoot Peter, and the gun blows up in his hand because of webbing.Kraven returns and both fall into the sewage and are never seen again. In Eyes Without a Face, Spider-Man has been active for a while now, but still considered a vigilante. The police don't seem to mind him, and he tries to better the community. Except when Doctor Octavius rolls into town, Robbie Robertson tries to infiltrate his complex alongside Peter Parker, as his aide, to discover the evil human experiments being performed. In the meantime, the World Union of Free Enterprise National Socialists (later renamed the Nazi Party in Real Life) is trying to get a foothold on American soil, and are secretly sponsoring Doctor Octavius and supplying him with people of African descent, done by the Crime Master and his right hand man Sandman. Spider-Man traces the Crime Master, and tries to apprehend him, this goes wrong as the Sandman beats him to a bloody pulp. As the police gun him down, the Crime Master gets away and hides at the Black Cat. Peter goes to recover at Felicia's, and the information she supplies makes him figure out what's going on, and goes to confront Octavius, where he discovers Robbie has been lobotomized. In the meantime, the Crime Master has figured out the relationship between his girlfriend and Spider-Man and he severely disfigures her. Enraged, he goes to Otto's hideout and starts killing African-Americans. Spider-Man encourages everybody who hasn't shot anybody to surrender and not join the Crime Master on death row. Otto Octavius, angry at the Crime Master's callous killing, stabs him to death with his surgical implements. He surrenders to Spider-Man, who is about to execute him until Jean De Wolfe stops him. Otto gets his trial. And he gets deported. 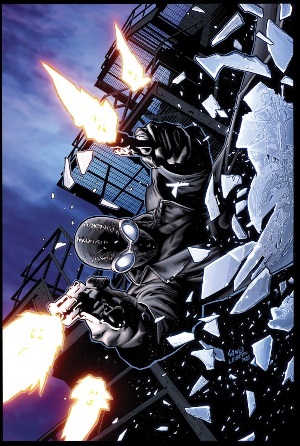 In 2014, Spider-Man Noir starred in a one-shot issue of the Edge of Spider-Verse in which he faced off against his world's version of Mysterio, following which he teamed up with Spider-people from other realities in their fight against the Inheritors. In 2015, Spider-Man Noir became a playable hero in Marvel: Avengers Alliance. Noir made his cinematic debut in 2018's Spider-Man: Into the Spider-Verse, played by Nicolas Cage. Absurdly Spacious Sewer: The final confrontation in the first mini. Admiring the Abomination: Peter for Octavius' experiments. Anti-Hero: Due to the tragic life he's led, Spidey becomes much more willing to kill. This changed due to Aunt May. Adaptational Attractiveness: Doctor Octavius is slimmer and more handsome than his usual pudgy, nerdtacular self. Crime Master is an odd example in that, while he's always been a villain, this version of him is far more evil and monstrous than all other portrayals of the character. For one thing he's a Nazi which is way past the standards his mainstream counterpart has. Curt Connors is Octavius's assistant in his experiments on humans, very different from his generally sympathetic mainstream counterpart. Badass Longcoat: As part of Spidey's costume. Big Bad: Norman Osborn in Noir, and Doc Ock in Eyes Without a Face (though he also more or less shares the role with the Crime Master). Bittersweet Ending: The first series is an Earn Your Happy Ending, while the second is a very bitter bittersweet victory. Black Best Friend: Robbie Robertson becomes Peter's in Eyes Without a Face. Body Horror: Osborn was born with a rare disease that gave him scaly skin. And due to how much he was teased and called a freak, this led to his Start of Darkness. The Brute: Both Ox and Sandman, the former for Osborn and the latter for the Crime Master. Bullying a Dragon: In the second mini-series a gangster gets invited to the Crime Master's HQ for a deal. He proceeds to insult the Crime Master and spit in his face... while Crime Master's hulking monster of a man Sandman is standing right behind him. Needless to say the gangster quickly regrets his decision. Circus of Fear: Norman Osborn recruited his inner circle from the circus, from which he himself is a refugee. Coat, Hat, Mask: Spider-Man and the Crime Master's typical attire. Complaining About Rescues They Don't Like: Spider-Man shoots Toomes, and Aunt May derides him for using fire arms. Crapsack World: The authorities are corrupt all the way to the mayor of New York. This Spider-Man doesn't string up criminals and leave them to the police simply because they cannot be trusted to uphold the law. It says something when J. Jonah Jameson is the most moral authority figure in the setting. Cursed with Awesome: When Peter got bitten by the mystic spiders, he hallucinated that a spider god would give him "The Curse Of Power". Considering how the Spider-Man powers have affected other Spider-Man, this isn't actually that far off. Darker and Edgier: Like all of the Marvel: Noir series. Dark Is Not Evil: Spidey's costume is almost entirely black and his appearance generally looks dark. And although this version of Peter is more aggressive and violent, he is still noble and ultimately wants to make New York a better place. Disney Acid Sequence: When Peter gets bitten by the spider he receives visions. Drugs Are Bad: Ben Urich does heroin, which makes him complacent and easily controlled. Octavius gets one with a Gross-Up Close-Up of an ape with his brain being vivisected in Eyes Without a Face. Earlier Sandman silently crushing the head of a man who had disrespected the Crime Master. Norman wants a Spider idol, which is covered in big fat widow-like spiders. As soon as the box is opened, they swarm Fancy Dan and eat him. Kraven suffers the same fate. Evil Cripple: Doctor Octavius is a paraplegic. The Evils of Free Will: For so called "Lesser races"
Food Slap: Pete chucks a scotch in Norman's face when he mentions Uncle Ben. The Freakshow: Osborn's crew is made up of former circus performers and freakshow stars, including Osborn himself. Gender Flip: Jean De Wolfe, usually female, is a reimagined as a male Federal Agent in Eyes Without a Face. Greater-Scope Villain: Ansel's presence in Eyes Without a Face is all over the book, but Spider-Man doesn't even learn of his existence, or the fact he was behind the Crime Master's initial actions. He Knows Too Much: She, Black Cat, which costs her her face when the Crime Master discovers that she has been playing him. Herr Doktor: Doctor Octavius and Doctor Conners, both already mad scientists, are now also Nazi sympathizers. Identity Impersonator Chameleon is in the first book, but you won't know until The Reveal. I'm a Humanitarian: The Vulture was a freak show geek willing to eat anything, including people. Intrepid Reporter: Peter, Urich and Jameson. And unlike other incarnations, Jameson is firmly in the side of good and less of a Jerkass to Spider-Man. Ironic Nursery Rhyme: About the Sandman. Karma Houdini: Nicely subverted with Dr. Octopus, who gets away with his experiments... only to get insulted and rejected by the Nazis that he practically worshipped because he doesn't fit their definition of a Master Race. Latex Perfection: Osborn's mask, which hides his scaly skin. Likes Older Women: Peter himself, being in love with the thirty-something Felicia Hardy. Master Race: Octavius is snubbed because his handicap is genetic, not accidental. Miss Kitty: Aptly, Felicia, here the proprietor of a speakeasy. Mook Carryover: "Fat Larry" runs a seedy joint first for the Goblin, then for someone else, and finally for the Crime Master. Morality Pet: Literally, Kraven's monkey for Kraven. Hie grief over his death provides a small spark of goodness, enough for him to survive a bit longer after being overwhelmed by the mystical spiders to kill Osborn. Felicia never turns into a superhero or a Classy Cat-Burglar, but her establishment is called "The Black Cat". Osborn is always seen in a stylish purple and green waistcoat. Kraven's death by being covered in spiders is highly reminiscent of what he experienced in his hallucinations in Kraven's Last Hunt storyline. Neutral Female: Black Cat runs a "respectable" business and can't afford getting in between Spider-Man and the bad guys. Nice Hat: An occasional part of the Noir Spidey costume - he only wears it a couple times. No-Holds-Barred Beatdown: Spider-Man is on the receiving end of one of these by the hands of Sandman. Nothing Personal: Urich claims this is what Peter and May are to him - just things getting in the way of his business. Screw the Rules, I Make Them! : Norman, who at one point makes it clear that he is so well-connected and high-up on the social ladder that he could kill someone in a room full of witnesses and get away with it. Sssssnake Talk: Toomessssss, emphasizing how animal-like he is. Snow Means Death: Ben Urich's funeral. Spell My Name with a "The": This version of Peter Parker stands out in that he's referred to by the public as "The Spider-Man." Superhero Packing Heat: Spidey himself uses guns. Terrible Trio: The Enforcers, as usual. Those Wacky Nazis: Nothing Wacky about the ones in Eyes Without a Face. Vigilante Man: Spider-Man, moreso than usual given that he is both willing to use a gun and kill. Norman Osborn breaks down altogether when he realizes Spider-Man is going to arrest him, meaning he will be forced into a jail cell, a new kind of cage for him after having escaped life as a circus freak. Crime Master loses his composure completely when it becomes apparent that Felicia Hardy has been cheating on him with Spider-Man, to the point of scarring her face. Wall Crawl: In the comics, this is notably absent from Spidey's power set, though he can do it in Spider-Man: Shattered Dimensions. Whole Episode Flashback: The first three issues of Noir are a flash back building up to the Cold Open. Why Don't You Just Shoot Him? : Spider-Man does. Except for, of all people, the Goblin, due to the lecture from Aunt May. Of course, he got his anyway. The Worm That Walks The spiders while still eating Kraven, force his body into the sewers for the climax. Would Hit a Girl: Crime Master, up to and including carving up Felicia's face. You Have Outlived Your Usefulness: Ansel states this about Crime Master.